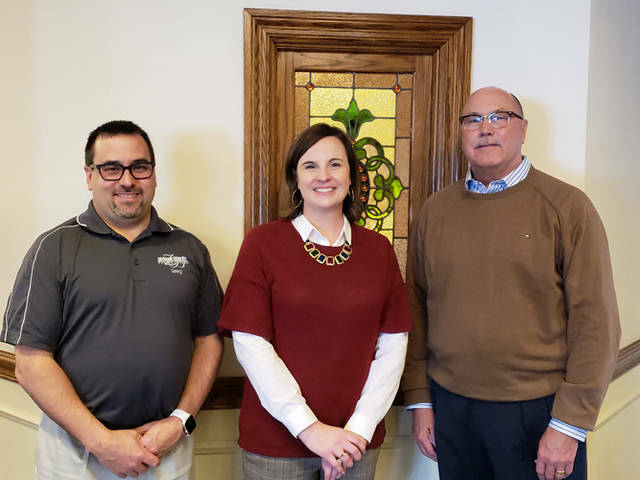 A Taste of Wine & Jazz fundraiser sponsors Greg Zechar (left) and Kent Zechar (right) of Zechar Bailey Funeral Home are pictured with with Darke County Center for the Arts Executive Director Andrea Jordan (center). GREENVILLE – Darke County Center for the Arts recognized Zechar Bailey Funeral Home for its sponsorship of the recent A Taste Of Wine & Jazz XXXI, held Jan. 18 at Montage Cafe. “Darke County Center for the Arts is grateful for the generosity of sponsors like Zechar Bailey Funeral Home, who value and are willing to support the arts in our community,” DCCA’s Executive Director Andrea Jordan said. A Taste of Wine & Jazz included four wines for tasting, complemented by hors d’oeuvres created by Aaron and Michelle Cox of Montage. Deron Bell And The Jazz For You Band returned to bring the party to life. Bell and his Jazz For You band have earned a large local following. Additional Wine & Jazz sponsors, who made the band’s performance possible and the evening a success include Kent and Melinda Myers, Geoff and Jessie Surber, Edward Jones Investment Representatives Zachary Bruening, Dave Connelly, Ryan Carpe and Todd Subler, Fry and Company, and Family Health.